The fresh hop cruise continues. 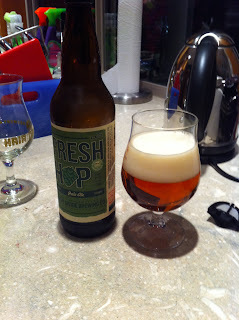 This week I picked up great divide's fresh hop pale ale. Get these little gems while they last! It's just a fun time of year to drink beer. Between Octoberfest beers, Pumpkin Beers, and Fresh/Wet hop ales we are awash in seasonal beers on limited release. Go get all that you can! This is the least local of the fresh hop beers I've drank but one of my favorites. The bottle opens with a lovely. Citrus and piney aroma and pours clear clean amber. The head billows up and then settles into a thin film on top of the beer holding the flavors in and lacing the glass. The flavor from the hops. Comes forward in a gentle cascading wave that is more than pale ale but without the bitter hop bite. The flavors are grassy and fresh celery notes. It has that, just rained in the forest fresh earthy taste. The malt shows up in the middle to help settle the hops down a bit and keep it from biting. Then the lovely fresh hop aftertaste settles on your tongue. The oils slightly dry it and make you thirsty for another quenching sip. This is a beer you have to hold yourself back from drinking quickly. It's so flavorful and gentle you could gulp it down. The way the aftertaste lingers it keeps drawing you back for more. Just lovely and one of my favorites. This is what I look for in a fresh hop beer. The subtle gentle flavors that bring a pale ale up to noble status.